Deliver-Eze features a patented anti-theft delivery mechanism. The cleverly Australian-designed and engineered Deliver-Eze® parcel letterbox range accepts large online shopping packages, courier deliveries, parcel post, holiday, bulk and regular mail simply and securely. Three stylish versions share a versatile and high-quality modular design that suits the majority of home mailbox applications. 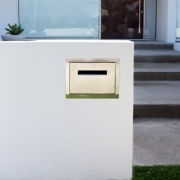 The locally manufactured Deliver-Eze Malvern parcel letterbox integrates smoothly into most kinds of new and existing fences. 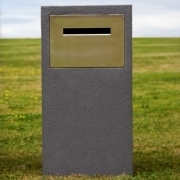 The locally manufactured Deliver-Eze Brighton parcelbox letterbox is designed for installation in brick, masonry, block and stone pillars or walls. The world leading Deliver-Eze Mosman pillar parcelbox is a stand-alone, cost saving item developed for homes without front fences. 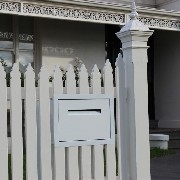 EASE OF USE: any courier company and Australia Post can deliver packages to your parcel letterbox. No special code required. SECURITY: patented anti-theft chute that prevents parcels being fished out, locking storage compartment. SPACE EFFICIENCY: the chute maximises load capacity and allows secure delivery of multiple parcels and boxes up to A3 footprint size into a locked rear-access storage compartment. UPMARKET GOOD LOOKS: accentuated by premium marine grade stainless steel and Dulux powder coat finishes. CLASS-LEADING DURABILITY AND REFINEMENT: underpinned by top-grade components, heavy duty pre-galvanised and phosphated steel construction, protective coatings, optional harsh environment finishes. SELF-CLOSING DELIVERY DOOR with precision mechanism. SHOCK-ABSORBING MAT to help protect incoming parcels. FIRST-TIME DELIVERY BENEFITS – save time, save the planet. No more driving to collect parcels, no more re-delivery runs for couriers.